I need a fast, consistent way to carbonate for customers. Received good ratings. Looks to have a practical use. Wanted to try this concept. This can solve the problem of either having to rock a keg on it's side to force carbonate. Needed a better way to carbonate, it came across the bottom of the screen as a suggestion when I was looking for the sparge arm. Assist in reducing carbonation time during kegging. add a little sparkle to your wine! Iâ€™d rather not roll the kegs on the floor to force carbonate them! Can this be left in the keg, for the keg duration, with CO2 attached to it, or should it be removed and replaced with a 'regular' lid when the keg is carbonated? BEST ANSWER: I would highly recommend the lid to be left on for the duration. If you try to swap it out you at best would lose some carbonation, but also might cause an eruption as the gas might excite the beer causing it to overflow. I have historically bottled soon after carbonation but using it as a serving vessel works fine as well. This is the reason you need multiple!! I have left it in and had no adverse impacts to beer taste. The only issue was cleaning the stone after the keg was emptied. I recommend removing the carbonating lid and replacing with a standard keg lid. It stays on for the duration. When your desired carbonation level is reached just hook your CO2 back to the normal post and dispense like any other keg. I just use it for the first three day, then purge and cap so I can use it on the next keg. You don’t need to remove the lid after carbonation is done. Will this work on smaller kegs? Is tubing connection barbed? BEST ANSWER: yes, the fitting is barbed. you can shorten it as much as you like. You could also just let the slack coil up in the keg, it will still work 100% the same. Yes, I have used these with 2.5 gal kegs without a problem. Just have to coil the tube a little bit to get it fit. Does this carbonating lid fit torpedo kegs? BEST ANSWER: I purchased this carbonating lid for the 2.5 gallon Torpedo keg that I bought two years back; so, yes, it does fit. It is much more efficient and worth the money. I believe it should work for a torpedo. From what I understand a torpedo uses a standard corny style lid. My only complaint is the hose is kinda stiff with a curve to it... had to work at it to get it straight enough, but once it is broken in, it is fine. The quality of weld and etc are all very good. Sometimes it takes longer than 24 hours to get a good carbonation, but it depends on the beer and it is very forgiving. You figure it out and make adjustments. Did not really change the pour, in fact, its not as creamy as before. We tried adjusting PSI, no real difference. How long did you carbonate with the lid? I m pretty new to kegging but this seems to do a good job. After quick force carbing a batch I ended up over carbonating it and that was enough to make me want to buy this. Set the psi at the regular amount and just give it a couple days. Seems to work well so far. Would give more stars but lid did not seal on my 5gal homebrew keg. Used hose on co2 inlet and worked. Used it for nitro coffee and it did help getting the nitrogen to absorb better in solution. This lid works on everything I want to carbonate. I have had about a dozen of them for a few years now and they hold up to constant use. We use them for Co-worker side projects here at Dogfish Head Brewery. It used to take 3 days and shaking the keg in order to carbonate my beer. There are posts on the internet that talk about shaking your keg and using high pressure to get 24 hour results but I have found that the CO2 just falls out of suspension. With this carb lid, it works just like a bright tank and I get good carbonation that "sticks" in 24 hours. Love this because I hated waiting for my beer. This is a crazy handy tool. Works very well. Purchased so I could carbonate overnight for bottling with a bottling wand the following day. Per other reviews, yes this does appear to be a cheap Chinese made lid. And just as Jay H commented, I didn't have a problem with the lid sealing, but the CO2 port leaked terribly. I used a generous amount of Teflon tape and still can't get a good seal. In fact, the port leak was so bad it's likely there was never enough psi in the keg for me to know if the lid was sealing or not. I can usually get to 80-90% of the carbonation level I'm looking for in 2-3 days so just going to write this purchase off as another "patience is a virtue" lesson. Another issue was that the tube that the stone is attached to is pretty rigid, and too long. It pushed against the bottom of the keg, and made removing the lid difficult. Curious that there are so many good reviews...Guess that shows how inconsistent the manufacturing process is with this product. Fantastic idea, (1 star for that) but unable to recommend. I've had this for years, and I've never had problems with the lid not sealing properly. If you follow the instructions you will have fully carbonated beer much faster than any other method that I've tried. After a lot of online research and contacting morebeer support (they couldn't really answer my questions), I wrote out detailed instructions for myself on how to accurately and properly use this carbonating lid and stone. This should get your beer perfectly carbonated every time. The problem is that the instructions that come with the lid do not explain wetting pressure, and if followed, you will almost always come away with under-carbonated beer. Wetting pressure is the PSI threshold for bubbles to start coming out of the stone. If the wetting pressure is a typical 4 PSI, and you give the stone 2 PSI of CO2, no bubbles will come out, like they would if you were just adding CO2 to the headspace of the keg via the body connect (IN). THIS IS CRUCIAL. You can find your wetting pressure by submerging the stone in a glass of water (connected to lid line, and gas connected to lid port). Slowly crank the PSI on the regulator until bubbles start coming out - when they start coming out of the stone, note the PSI on the regulator and that is your wetting pressure. I hope this helps! to get a good seal before purging and before setting lid with handle lever. well until the beer is at your target temperature. NOT lid port to carbonation stone). Slowly purge keg a few times with this 4 psi. After purging, let 4 psi sit for 5 minutes. purge the gas from the REGULATOR and turn regulator NOB to the left so zero gas is entering/will enter regulator. 5. Turn on small gas valve (no CO2 will enter line) and connect the gas to the LID PORT (to carb stone). hour (and check a couple times in the first 10 minutes to make sure it is holding at 6 psi). 7. After 1 hour at a steady 6 psi, slowly raise to 8 psi. Do this every hour until the final desired psi is reached. degrees F, you will need the final psi on the regulator to be 16 psi (12 psi + 4 psi wetting pressure). and check periodically to make sure the psi is holding. around 12 PSI when connected to the KEG BODY CONNECT (IN). If this is the case, good job! It worked. are both good, beer is ready to drink and bottle! Awesome product! Just follow these simple steps. Great product, I can never go back to the old way of carbing a keg again. 1. Boil the carbonation stone for 2-5 mins. 2. Use hot water on the black tube to straighten it out. 3. Make sure your beer is nice and cold. 4. 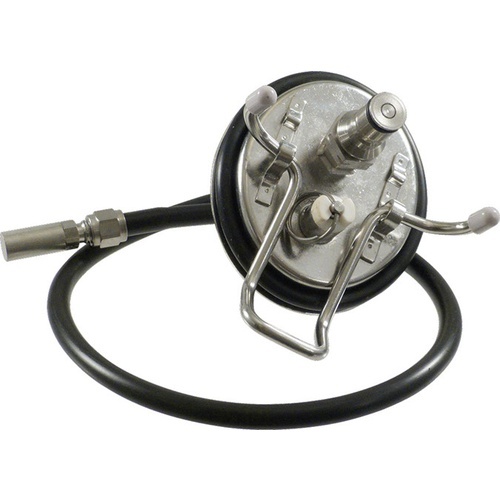 Hook up your CO2 to the lid and purge the oxygen before putting in the keg. 5. Put keg lube on the rubber seal. 6. Insert the lid into the keg and lock in place. Hook up the CO2. 7. Put about 5 PSI on the keg for 2 hours. 8. Throw up the PSI to 12-15 for 24-38 hours. Test your beer. 9. Release the CO2, remove the lid, clean the lid with cold water and boil your stone for 5 mins before storage. I didn't force carbonate. I just installed it and let it do its thing. I'll be buying another one soon! I prefer to let the beer come of age slowly. In a pinch this hits the beer a little harder. I've had great success with mine. Two suggestions, one boil the stone after every use and two, get a check valve for your gas. I've had mine back up into my head line. This is a great product! I did not have any sealing issues. Perfect carbonation in 24 hours. I do recommend keg lube for any sealing issues. Also don't forget to perge the oxygen! Love it.. works as expected. Be warned. Follow the instructions. It can be tough to get your pressure regulator low enough, but once you master it - works well. Hint, wash the tube in very hot water and it will straighten out. I do have a couple of cornies that the fit is not quite right. Keg lube fixes it pretty well. Easy to use - quality product. This works great - no problems so far. I have not experienced the sealing issues others have said. Bottom line is that i can carbonate a keg in about 24 hours, or 36 at most. It is a little tricky to fit into the keg opening, but nothing too difficult. I've had it for about six months now. The reports of the lid being slightly smaller than normal for corny kegs is accurate. I use keg lube, and I pressurize the keg at around 16 psi to get a good seal using the normal gas in line. It still develops leaks. It has been about a 50/50 shot in my experience as to whether it seals and is usable or will have a slow leak. I learned the hard way to keep a close eye on it whenever using it. I brew (relatively) a lot of beer - I'm usually kegging a new beer about every 10 days. So, I have giving this thing a fair chance. As of tonight, I'm done with it. I would have chalked it up to having received a bad unit, but a buddy has one as well and has the exact same problems. If you have the means, you would be better off building one on your own. That's what I'm going to do next. Using a carbonation stone is great - but it's just poorly implemented in this product. I haven't used to carbonate yet but tested the fit due to the past reviews. I had no issues with the lid to the keg but did experience one at the CO2 port. Even though this fitting has o-ring it did not seal properly. I tried to tighten the fitting and was sill unsuccessful so I had to use teflon tape on the threads and then had no leaks. I'm not sure why that was my issue but I made sure to test it out first due many comments in the reviews. A tip on checking the seal is to use a sanitize solution in a spray bottle on the lid and fittings when a few PSI is applied to the keg. Any leaks should show bubbles if they are small; if there is a big leak however it should be apparent or easily recognizable. It didn't work as I was expecting it too. I don't know, maybe my expectations were just way too high. I followed the instructions to the letter but didn't get near the amount of carbonation I was hoping for. I had almost no pressure in the keg at all until I cranked it up to about 10psi. Just sort of disappointed. Great product, follow the instructions and it will be just right. I've used this lid twice now, with great results. One batch was a stout on Nitro Beer Gas and it worked like a charm. I have not noticed a difference in taste using this lid vs. normal force carbonation, it just happens faster! Able to carb and transfer several kegs a day using this in just 2 kegs, then transfer the beer to another clean keg that doesn't have the stone in it. You can vent for carbing in about an hour, or you can simply follow the instructions and it takes about a day, or overnight. Works great and I'd highly recommend this. Sure beats shaking kegs for hours everyday as I used to do. The lid, connectors, hose, and stone are all top notch quality and they fit my kegs without any problems. I was hoping that this would significantly decrease the time to carbonate my beers but my experience has been that unless you do a lot of shaking it only shaves off a couple of days. You can shake to speed up carbonation with a normal corny keg so there's only a slight benefit from this setup. This makes carbonating a breeze. Many commercial breweries use carbonating stones so why not us homebrewers. I have carb'd several batches with this using the easy to follow instructions and the beer is ready to drink in no time. Beats shaking/rolling the keg or waiting for a long time for the beer to carb. I usually clean and sanitize a second keg and then transfer after carb is done. 1. I get from fermentor to full carbonation in about 3 days by cold crashing overninght, charging initially at about 5 psi manifold pressure for about 2 hours (pressure delta across the stone is about 3 psi), then increasing pressure every couple of hours by about 1 psi until i get to about 12-13 psi, then rest for a few hours or overnight then vent CO2 and swap for original lid. 2. Sterilizing/cleaning the stone is quite easy (and necessary). The included instructions are good. 1. While the concept and even the modifications are good, the lid itself is garbage. It fits so poorly that even when I glop on the keg lube (and I have to slop it on as thick as it will go on the o-ring) I still have to manipulate, twist, and jiggle the lid for about 20-30 minutes to get a seal. I'm a chemical engineer with nearly 20 years hands-on experience with R&D and pilot-scale fluid systems and pressure vessels, so I know my way around stainless vessels and seals. I would neither buy this again, nor would I recommend it unless one could determine beforehand that it was made from a properly manufactured lid rather than a cheap chinese knockoff. Were that the case, I'd rate it five stars and buy another one. I was looking at this device to add into my cart. I had planned to purchase it, but after reading your review, I can't take the plunge. I own 8 AEB kegs and find them top quality. If this base lid was like the AEB's, I would have one ordered today. Not happening. I have 3 Kegco 5 gallon strap kegs and this lid doesn't even come close to fitting; it is way too small. I read some of the previous reviews that the lid was a "little too small" and was difficult to get a propper seal. I can almost pull this lid straight out of the keg opening without tipping it. I would say that it is a problem with my kegs, but I have interchanged a friend's Corny keg lids in my kegs without any size problems. I'm not sure if this was unique to this specific lid, but I'm not going to order another to find out. Do not use on a permanent basis! Flare fitting is nickel plated brass and seems to leach! I've used 4 of these to carbonate soda and beer. Unfortunately the 1/4" flare fitting for the diffuse stone is made of brass and seems to react in the beverage causing the fitting to develop a black film. This can't be good. I would highly recommend to replace these with real steel flare fittings if you can find them somewhere. Note that the diffuse stone itself is steel and stays perfectly silver, so that does not seem a problem. You could probably just remove the flare and use clamps to attach the diffuse stone to the line. I've been using two of these now for about 15 brews over the last 18 months or so. They work great. One thing I noticed here recently is the need to keep them very clean. I lacked on this until recently. I figured just washing them off and storing them would be sufficient. You can hear the O2 bubbling into the beer as it works and the last few batches were silent. After taking it all apart, I narrowed the fault in my system to the stone itself. I boiled my two stones for about 20 minutes and got one to work again, but the other is still clogged. I may have to buy a new stone. My plan is to boil it for a long time and see if it gets unclogged. From now on, part of my cleaning process will be to remove the stone and boil it before storage in the hopes that keeps it unclogged. There's no need to vent off co2, and wait several hours or days for that matter. Simply follow the instructions until you reach 12 PSI, and it is ready to go! I found this product to produce great results in a very abreaviated period of time. with the CO2 bubbling up from the bottom, I easily achieved the desired carbonation in less than 24 hours. I would recommend this product highly as it performs just as specified. Mine seems to have come from an original corny lid so it fits well. Based on the other reviews, I guess that's a hit or miss as it may be a cheap lid or may be a nice one like mine. I have always hooked the co2 up to the liquid OUT side and forced carb that way, and it works well but takes about 48 hours. I got this lid because I kep forgetting to vent after carbing and when taking the gas line off I would shoot beer all over. However, when hooking this up I can't hear any gas entering and there's no pressure when using the vent release. I assume it's because of the holes being so small it leaks in slowly, but after only having used it a couple times I'm not even confident it's working until leaving it for a day. Overall, it seems to work well and eliminates my exploding beer problem. Works as advertised. The patient brewer will get adequate carbonation with out this. My only advice is to ensure that you don't crank the pressure too high or you will blow the stone off the end of the hose and have to finish the keg before you can retrieve it. I had no issues with sealing as others have posted. However, after following the instructions of cooling the keg to about 34 degrees and then starting out at 3-4 psi and increasing every hour until at 10-12psi and then letting it set for 24hrs. I tested and there was very little noticable carbonation. I let it set for another day (24 hrs or so) and the same thing occured, very little carbonation. It took me shaking the keg before I could notice that CO2 was going in. I also had to purge the head of the keg several times to sort of "draw" the CO2 in. It was faster and more accurate than just letting it set or the high pressure shake methods, but I couldn't get it to work as advertised. Happy with it, but wish it worked as good as advertised. This lid works at carbonating your beer quicker than just hooking up the CO2 line the the keg, but it's not the only way to carb quickly. I wish I knew what I know now when I was shopping for this. I was tired of the shake and roll method. Follow the directions and all turns out fine. Thanks More Beer!!! Thats about all i can say about it. It took me a few tries to get it right but it does work as advertised. You can carb a little quicker with this, but i did have a few issues at first. Maybe i just dont quite have the hang of it yet. I was however trying to carb the beer quicker than what the instructions suggested, so im sure its my fault. Overall it works pretty well. Works well, does the job as advertised. Works great at carbonating beer. 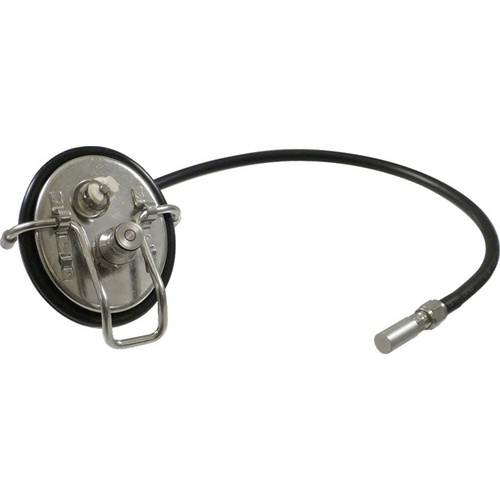 It can be difficult to get an airtight seal, usually takes a few tries and/or replacing the o-rings. LOVE this thing. Only way I carb my beers now. This lid makes carbbing my beers sooo much easier. The lid that came with mine was a standard corny keg size so did not have the same issue with incorrect lid size a previous reviewer had. You can overcarbonate if you forget it is hooked up but that can happen with any carbing method. There are a few situations where it would bebefit, but after using it a few times, I seem to prefer the beer to carb over time. If you have the time, take it. The beer will almost always taste better. If you don't have time, get this lid. This works as intended, but I have a couple of issues. Both issues are related to the metal lid it self. It's a cheap generic lid. Issue 1. The lid is slightly undersized so the size 417 o-ring is just laying on the rim (not gripping it like all my other lids). After carbonating the first keg, the o-ring slipped right off into the beer! Secondly because it was undersized, it took a couple of tries repositioning it to install so that the seal didn't leak. I am going to try an oversized o-ring the next time I use it and hopefully this problem goes away. Perfect Carbonation within 24 hours. There are certain instances where you want your beer carbonated quickly without all the hassles. I have tried the crank and shake method before, but usually end up waiting an extra couple of days for the extra co2 absorbed in the solution to go down to drinkable levels. The "set it and forget" method seems to take too long, when you're anxious to try one of your new brews. With the carbonating keg lid, you're able to carbonate the beer just like the "set and forget method" within 24 hours. There's no need to vent off co2, and wait several hours or days for that matter. Simply follow the instructions until you reach 12 PSI, and it is ready to go! I will be using this on every single batch from here on forward. Thank you MoreBeer, for making the kegging process easier.